This listing is for 20 Bridal Shower Corset Soap Favors perfect for a bachelorette party, lingerie party, girls night out and bridal showers. 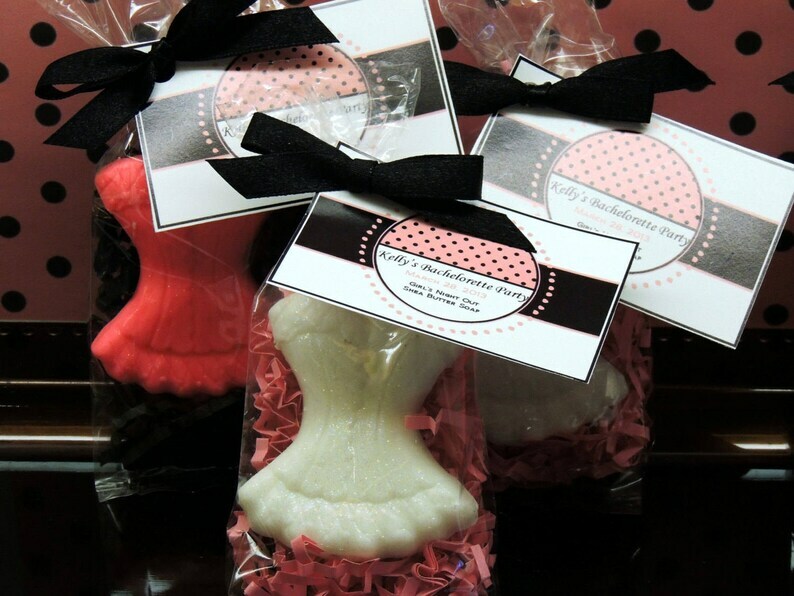 Corset Soap Favors scented in your choice of scent. Each favor includes one soap. We can add a pinch of cosmetic safe soap glitter to the soaps to add a bit of sparkle. Soap measures apx. 2 1/2" tall and 2 1/4" wide and about 1/2" thick. 2) SOAP COLOR(S): Choose one color for your set of 10 soaps. 4) GLITTER OR NO GLITTER? We can add a pinch of cosmetic glitter for a little pizzazz. 7) PAPER SHRED (THE WORKS OPTION): light blue, kraft brown, red, yellow, pale blue, green, lime green, pink, bright pink, purple, lavender, teal, white, ivory. 8) PARTY COLORS so we can coordinate the tags, if applicable. Ingredients: Coconut oil, palm oil, safflower oil, glycerin, shea butter, purified water, sodium hydroxide, sorbitol, sorbitan oleate, soy bean protein, titanium dioxide, micas, cosmetic safe glitter, fragrance oil, cosmetic safe glitter.